Want to Declutter your space yourself? We’re here to help! You might be on a tight budget or a little embarrassed about your space, don’t worry, we can give you guidance, a starting point and a plan to master your mess! Get affordable, high quality online coaching to declutter and organise your home. Complete with your personalised plan, you will get motivation and expert help on how to deal with the clutter! This service opens on the 1st of each month for 72 hours. We can only facilitate a maximum of 12 slots per month. The link below is only live once booking is available at the start of each month. This a per project price. What is an Online Declutter It Yourself service? You know what to do, but we’ll show you how to do it! This service offers you access to expert organising advice via video conferencing facility Zoom to help you clear the clutter. You get expert help for an amazing price and it allows you to declutter at a time that suits you, working on it at your own pace! You will receive an email confirming the booking and details on how to prepare for the video conference. Get started on your Action Plan and transform your space at your own pace! 1. 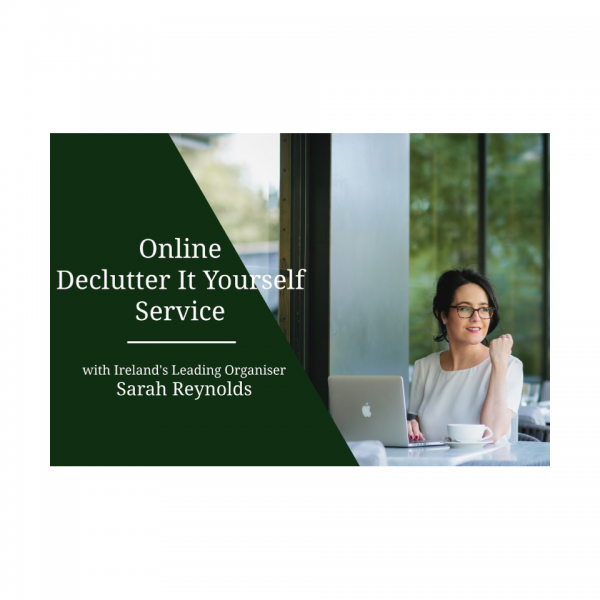 A 60 Minute video call with Professional Organiser, Sarah Reynolds. The organisational pain points that you are currently struggling with. Then using the phone/ computer camera, we go around the room, looking at every drawer, press and piece of furniture in order to create the Action Plan and determine what to do with the room so as to maximise it’s use, organisation and achieve your goals. If you’re the type that works better alone, this D.I.Y. service is perfect for you! This link is LIVE on the 1st of every month for 72 hours!